MADAM CHANCELLOR, Dr. Justin Yifu Lin is a prominent and prolific economist in international policy circles, and his work has compellingly informed global debates concerning development, agricultural economics and Chinese economic reform. From 2008 to 2012 he served as Chief Economist and Vice President of the World Bank, where he provided intellectual leadership in shaping the economic research agenda of the institution. Dr. Lin also served for 15 years as Founding Director and Professor of the China Centre for Economic Research at Peking University, where he currently serves as Honorary Dean of the National School of Development. He holds a Master of Business Administration degree from National Chengchi University, a Master of Arts in Economics from Peking University, and a Ph.D. in Economics from the University of Chicago. He has authored over 30 books, and his publications appear on syllabi around the world, including UBC, where his scholarly work is well known among faculty members in Economics and Asian Research. He is a Corresponding Fellow of the British Academy and a Fellow of the Academy of Sciences for the Developing World. Development Bank, and the Global Agenda Council on the International Monetary System. Although he holds honorary doctorates on three continents, he has yet to be so recognized at a prominent research university in North America. In light of this university’s deep commitment to global issues, and its long-standing focus upon Asia, we are today honored to be the first. 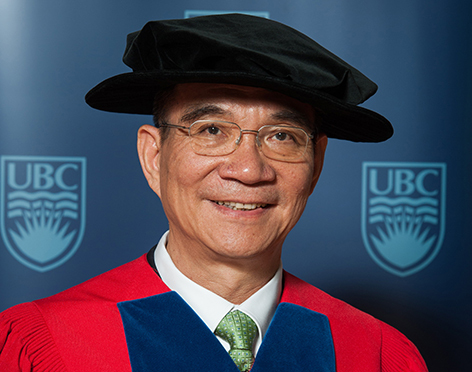 Madam Chancellor, in recognition of his prodigious scholarly output and impactful leadership in moving the global debate on development and economic reform in new directions, I ask you to confer the degree Doctor of Laws, honoris causa, upon JUSTIN YIFU LIN.